As we dig deeper into our mixtape series, we invite one of Bristol’s most hotly tipped young producers Artifact to take center stage. Bringing an energetic blend of bass heavy tunes and a strong selection of dubs, he doesn’t disappoint! Those with an ear to the ground in the UK dance scene will have heard of Artifact, a fresh new producer from Bristol creating a unique sound that merges hard hitting sounds of Dubstep with the swung rhythms of 2-step, UK Garage and UK Funky. If you’ve ever heard one of his dubs on a dance floor, you will have known – it’s hard not to take notice when they drop. A multi-talented producer, Artifact is also part of the Bristol trio Portraits as well as the Juke collective Grunk & Crime. Having had tunes signed to the likes of Car Crash Set, Pollen, Deadplate and Fortified Audio, it’s clear to see that Artifact is going to be a name to reckon with in the very near future. Remember where you heard of him first! We love to showcase fresh talent within our mixtape series, sitting them alongside the more established names, so it gives us great pleasure to introduce you guys to the sounds of Artifact. 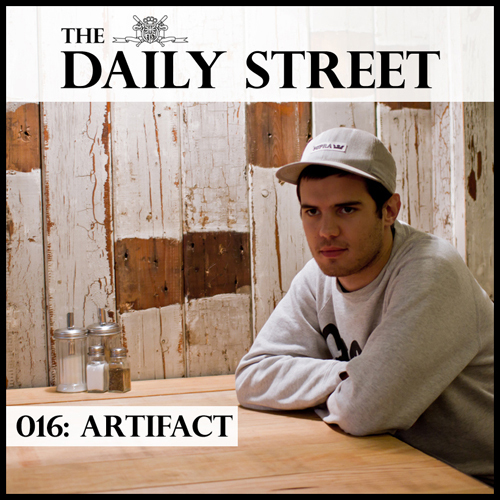 Bringing a smooth blend of Bass Music and whatever else surrounds that vague genre description, Artifact draws influence from UK Funky, Dubstep, UK Garage, Grime and House to create an absurdly bass heavy mix that is also packed with melody. With dubs from the likes of Hackman, Jamie Grind, Sully, Hodge and of course his own productions, it’s a seriously strong mix and a great addition to our ever-growing series.